"Aboriginal rights have once again been stepped on," said Chippewas of the Thames First Nation chief after Canada's highest court ruling. 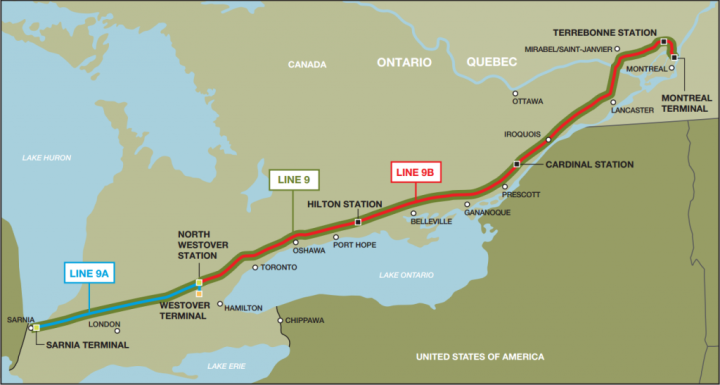 Enbridge Pipelines Inc. - Line 9B Reversal and Line 9 Capacity Expansion Project is a Canadian national energy project that proposes to redirect a crude oil pipeline that leads from Montreal, Quebec to Sarnia, Ontario. The goal of this project is to reverse the flow of oil from Montreal to Sarnia, so as to supply refineries in Montreal and Eastern Canada with domestically sourced Canadian oil. The proposed reversal involves refitting and expanding the already existing pipeline from 240,000 bpd to 300,000 bpd . Opposition to this project is derived mainly from environmentalists, affected communities, individual land owners, and Indigenous First Nations along the proposed route. This pipeline has a long history of contentious debate and political motives surrounding it. Built in 1976, Enbridge Line 9 is 831 kilometers in length and divided into two sections. Line 9A runs from Sarnia to North Westover, Ontario, and Line 9B runs from North Westover to Montreal East. The pipeline travels through much of rural Southern Ontario and Southwestern Quebec, both areas of substantial agriculture and inland river systems. Line 9 also passes within 50 km of an estimated 9.1 million people, including 18 First Nation communities, and directly through 99 towns and cities . As a result, Enbridge’s pipeline affects or has the potential to affect nearly a quarter of Canada’s population and some of the nation’s most ecologically sensitive areas. Issues of concern raised by the projects opponents, include the increased risk of oil spills and leakages along the pipelines route, damage to ecologically sensitive areas, possible water pollution and quality problems, concerns for species at risk, and First Nations rights. The latter, being openly presented in a court challenge of the Chippewas of the Thames First Nation v. Enbridge Pipelines Inc.,  where the Chippewas First Nation claim that Enbridge and the National Energy Board (NEB) failed in their ‘duty to consult’ with the local residents. Significant public attention was brought to this proposed project and to the First Nations court case, because the pipeline passes through the backyard of so many Canadians. Project Details Enbridge Pipelines Inc. - Line 9B Reversal and Line 9 Capacity Expansion Project is a Canadian national energy project involving a pipeline that travels from Sarnia, Ontario to Montreal, Quebec. The proposed project would see a reversal of crude oil flow from Montreal to Sarnia, and an expansion of pipeline capacity from 240,000 barrels per day to 300,000 bpd. Line 9 is 821 km long, and passes within 50 km of an estimated 9.1 million people, including 18 First Nation communities, and directly through 99 towns and cities. Enbridge Line 9 consists of two sections. Line 9A running from Sarnia to North Westover, Ontario, and Line 9B running from North Westover to Montreal, Quebec. Line 9A is 182 km long and has already been reversed. Line 9B is the 639 kilometer proposed reversal from North Westover to Montreal East . The affected population includes nearly one-hundred communities between Sarnia and Montreal, including 18 First Nations. Flamborough (Hamilton), Burlington, Oakville, Mississauga, Toronto, Scarborough, Pickering/Ajax, Whitby/Oshawa, Bomanville/Clarington, Newcastle/Newtonville, Port Hope, Cobourg, Grafton, Castleton, Brighton/Trenton, Qunite West, Belleville, Shannonville, Napanee, Odessa, Kingston, Glenburnie/Joyceville, Gananoque, Landsdowne, Mallorytown, Lyn, Brockville, Prescott, Cardinal (Station), Iroquois, Morrisburg Ingleside, Cornwall, Martintown, and Green Valley. Project Area: Pipeline is 831 km in length, affecting an area of over 41,550 square kilometers. Potential Affected Population 9.1 million people along the Quebec-Windsor Corridor. Other Irreparable damage to Class-A agricultural land in Southern Ontario and Southwestern Quebec. Other Potential: Sickness or death as a result of polluted water, Injury or death as a result of pipeline explosion. Long-term health consequences associated with contaminated water. Other: Increases in cancer and respiratory problems as a result of increased gas emissions in the atmosphere. Other Visible: Loss of landscape/sense of place, Loss of livelihood (Farmers), Land dispossession, Loss of traditional knowledge/practices/cultures (Aboriginal), Violations of human rights (Aboriginal), Lower land and property values, Decline of rural tourism and communal aesthetic appeal. Potential: The displacement of Indigenous and urban/rural residents as a result of water contamination/pollution, further depreciated land values, population decline of rural/urban communities near Enbridge Line 9, and national crisis/human loss from an explosion or oil spill. Development of Alternatives Abandonment of the proposed reversal by Enbridge and a study on how to decommission the pipeline, as alternative energies displace the future need for oil in Eastern Canada. Why? Explain briefly. On July 26, 2017 the Supreme Court of Canada dismissed a legal challenge by the Chippewas of the Thames First Nation, ruling that Enbridge and the NEB fulfilled their ‘duty to consult’ under the constitution. The Chippewas First Nation was seeking to have the reversal of Line 9 abandoned, and stopping the expansion of capacity for Western Canadian bitumen from flowing from Alberta to Montreal. The ruling affirmed that Enbridge’s operations could continue unopposed. This sets the precedent according to the Chippewas that indigenous rights may be freely trampled upon, even when the current government makes promises of affirming indigenous rights and strengthening indigenous relationships. Insult to injury was added by the ruling that the Chippewas First Nation were to award costs to Enbridge Inc. for the legal fees they incurred throughout the courts proceedings. As a facet of comparison, the Chippewas First Nation, a community of only 3,000 people, incurred legal costs of over $600,000 since 2012. One can only image that Enbridge spend considerably more on their defense than that of the small First Nation community, thus the Chippewas of the Thames are obliged to pay possibly millions to Enbridge, while at the same time their environment is degraded by the same company. Wu, H. (2014). A Case Study of the National Energy Board Decision: Enbridge Line 9B Reversal and Line 9 Capacity Expansion Project. Ryerson University: Toronto. [Major Research Paper].